Cut together flour, sugar, and salt with a rubber spatula. Cut the fat into the mix with a pastry blender or 2 knives. Drizzle 3 tablespoons of water over the mix and cut with a spatula until small balls form. Press down with the spatula to see if it sticks. If it does, don't add the last tablespoon of ice water, but if it doesn't stick quite enough yet, add one more tablespoon and mix again. Press until it coheres. Press into a round flat disc and wrap tight in plastic. Chill at least 30 minutes and for up to 2 days. Can be frozen up to 6 months in this state. To bake, put it in a 9-inch tart pan and press all the way up the sides, evenly pressing the bottom so that there are no lumps or parts that are not as thick as other parts. Cover with a layer of tin foil pressed right down onto the surface of the dough. Fill the tinfoil cover with weights--can be raw beans or rice. Black-eyed peas worked well for me! Bake at 400º F for 20 minutes. Take the weights/tin foil cover off. 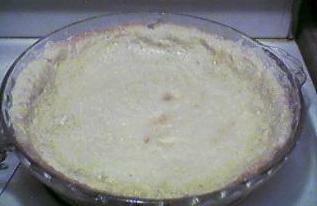 Prick the crust all over with a fork and bake for 5-10 more minutes; you're looking for it to turn golden brown. If it puffs up anywhere, you can prick the bubble and press it down with a spoon. Some recipes have a glaze of egg yolk or egg white that gets painted on after this and put back in the oven for just a minute or two to set. Follow individual recipe directions for what to do with it next.